It is with great sadness that the family of George Blebea born on April 15, 1927 in Ileni Romania, announces his passing on October 3, 2018 at the age of 91. George arrived in the United States in 1964 with his wife and children and worked at the American Steel Foundry where he retired in 1987. 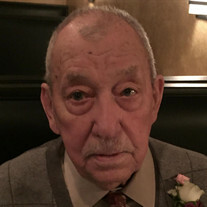 He devoted much of his life in service to the Orthodox Christian churches in the Alliance and Louisville areas and previously served as President of the parish council at St. Nicholas Romanian Orthodox Church for many years. He loved working outdoors especially in his "woods" and spending time with his family. George will be lovingly remembered by his wife of 68 years, Helen, and his two children along with their spouses, Georgeta (R. Corbin Washington) and Dr. John (Dr. Judy) Blebea. Georgeta is a retired nurse while Corbin is a retired banker and attorney. Dr. John Blebea is Chair of Surgical Disciplines at Central Michigan University while Dr. Judy Blebea serves as Associate Dean there. He will also be fondly remembered by his five grandchildren, Tiffany (Marko) Farian, John (Daniela) Washington, Elena (Gregory) Hollander, Christina Blebea (Narsiso) and Catherine Blebea as well as his three great grandchildren, Julian and Livia Farian and Callie Hollander. George will also be forever remembered by his numerous nieces, nephews, extended family and dear friends. Calling hours will be at Cassaday-Turkle Christian Funeral & Cremation Service at 75 S. Union Avenue in Alliance, Ohio on Friday, October 5 at 4 -8 pm with a religious service (Saracusta) at 7 pm. Funeral service will be at St. Nicholas Romanian Orthodox Church at 1621 S. Sawburg Avenue in Alliance on Saturday, October 6 at 10 am. Services will be officiated by Archbishop Nathaniel of the Orthodox Church in America. Memorial donations can be given to family members towards a memorial fund in memory of George Blebea to be given to Intimplinarea, DOMNULUI (Romanian Orthodox Church) in Ileni, Romania. Arrangements are by Cassaday-Turkle-Christian Funeral Home. Friends may register online at www.ctcfuneral.com.